ST. GEORGE – An ordinance and accompanying resolution making way for the City of St. George to participate in a countywide curbside recycling program were unanimously approved by the City Council Thursday. Officially called the BluCan curbside recycling program, the council’s vote also accompanies the launch of BluCan.org, a website about the program from the Washington County Solid Waste District. The website went live as the council meeting progressed, and is designed to educate county residents on the benefits of the program and how it works. Links to pages detailing how individual cities are participating in the curbside recycling program are also available. Currently, only Hurricane and St. George are listed on the website, with others to be added in the near future. Participating cities can either choose to offer an opt-out option for their residents or make the BluCan program mandatory. Cities choosing the opt-out option will have an opt-out period; St. George residents will have from Sept. 1 through Oct. 31 to opt out. During the opt-out period in St. George, residents can choose to opt-out either through the BluCan and City of St. George websites, over the phone by calling 435-627-ICAN, or in person at the utility counter at the city officers at 175 E. 200 North. Residents should expect delivery of their BluCan containers by Feb. 1, 2016. In order to help residents become aware of their options, the city will be engaging in an educational campaign over various forms of media. This will include a social media campaign, radio ads, notifications sent out with utility bills during the opt-out period, and other mediums. For people who wish to opt into the program, they really don’t have to do anything beyond waiting for their BluCan container to arrive. “It’s really simple to be in: you do nothing and start to recycle,” said Deanna Brklacich, the city’s administrative services director. The project allows residents to deposit paper, plastic, and metal waste into their own BluCan, a can that will be similar to their current garbage can. BluCan will provide curbside pickup of recyclables every other week. Glass is excluded from the list of acceptable recyclables for BluCan for now. 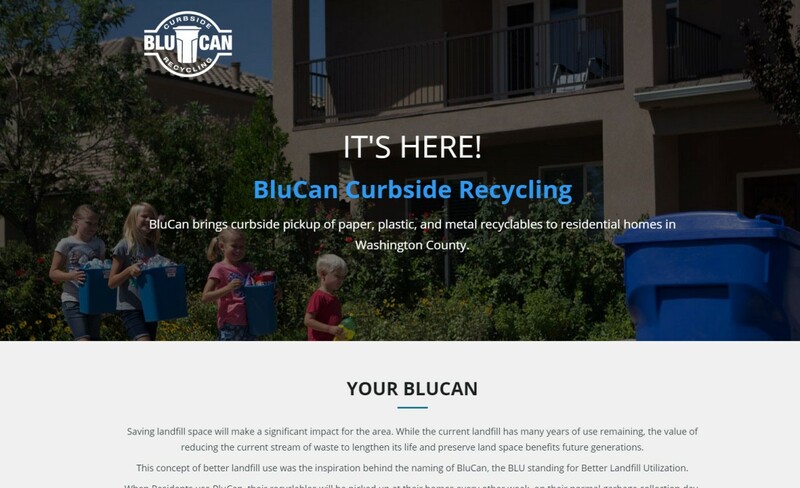 When residents place their BluCan next to their trash on their regular garbage day, Dixie Waste, which contracts with Washington County Solid Waste, will empty and haul the contents away for recycling. The initial cost per household per month for cities like St. George that allow residents to opt out is $3.82 per household per month. The city is adding an additional 18 cents to the charge to cover administrative costs on its end, bringing it to a $4 charge. The cost could go down depending on how many people across the county enroll in the program. If 70 percent or more sign on, the monthly charge could go down to a base rate of around $3, not counting additional administrative charges. If 50 percent or less enroll, the program will be put on hold. It is hoped by county and city officials that the BluCan program will divert a significant amount of recyclables away from the county landfill. Doing so is anticipated to potentially extend the life of the landfill by decades, plus save space the growing landfill would otherwise occupy. “We’re going to save some space in the landfill, and that’s a good thing,” Councilman Jimmie Hughes said. Saving landfill space will make a significant impact for the area. While the current landfill has many years of use remaining, the value of reducing the current stream of waste to lengthen its life and preserve land space benefits future generations. This concept of better landfill use was the inspiration behind the naming of BluCan, the BLU standing for Better Landfill Utilization. Although the BluCan program has been designed to provide a convenient way to recycle and have better landfill utilization, residents wishing to continue taking recyclables to public bins – commonly known as binnies – are free to do so. “We’re excited to try this and to try and move as many recyclables from the landfill as we can,” St. George Mayor Jon Pike said. The BluCan program applies to residential solid waste accounts only, and not businesses. 14. How will BluCan effect me? can’t wait for the tweakers and homeless to rifle through these on pickup morning searching for aluminum cans. I’m excited for this! Thanks for posting the picture with the can and can’ts.